Furnished Vacation Villa For Sale – Location, location, location!! Fantastic opportunity to acquire a stunning 5 bed, 3.5 bath pool home with lake view in the secure gated community of Sunset Lakes. This immaculately maintained property is being sold fully furnished & equipped and would make a superb residential home or picture perfect vacation rental with 2,600 sq. ft. of living space comprising 5 bedrooms (all upstairs), 3.5 bathrooms, 2 living areas, spacious, remodelled kitchen, utility room, double garage, south facing pool occupying a prime lot on the lake. Downstairs there is a family room off the kitchen with informal dining and sliding doors to the lanai & pool area; formal living /dining room combo (again with sliding doors to the lanai & pool); laundry room; half bath; 2 car garage w/ electric door opener. Upstairs are 5 spacious bedrooms; a beautiful Master suite with upgraded bathroom featuring dual sinks, large walk in shower and oval bath; King guest room, Queen guest room and two twin rooms along with 2 further bathrooms. The lovely private south-facing pool area features a heated pool, ample decking for sunbathing, hot tub & large lanai enjoying serene lake views. 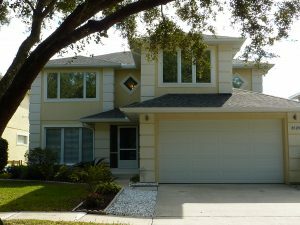 Despite Sunset Lakes being in such a peaceful location it is one of the closest rental communities to Disney with Animal Kingdom just 4 miles away and shopping & restaurants within a half mile drive! New roof in 2017.